Sony A7S Preview &ndash; A low resolution marvel for low-light &amp; video? 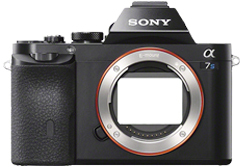 The a7S is the third model in Sony's full-frame mirrorless lineup, a 12MP camera that puts as much emphasis on its movie capture capabilities as its still image prowess. While the a7S is a capable still shooter, Sony has emphasized that its real focus (no pun intended) is videography. As video cameras go, the Panasonic Lumix DMC-GH4 and Sony Alpha 7S are very DSLR-like in shape. A four-fold difference in sensor size, and a significant gulf in price suggests this may be the only similarity. However, in terms of intent, they're not as different as all this might lead you to expect. We've already had a quick look at the new features of the GH4 but here we're going to test the two cameras side-by-side - not necessarily to find a single 'winner' but to see where each camera's strengths and weaknesses lie.